Taste test: These chips were fairly crisp but had an extremely soft crunch, so they just sort of disintegrated when you bit into them. 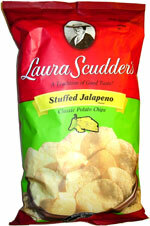 They tasted good, with a fairly mild but tasty jalapeno and cheese flavor. So you get the jalapeno flavor but not enough jalapeno heat to make you run for water. There was some jalapeno aftertaste as well, again hot but not super-hot. The afterburn did feel good in my mouth. Smell test: Nice potatoey smell, with just a little jalapeno.